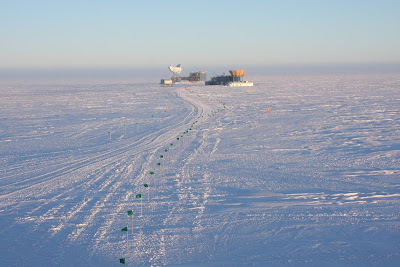 As I mentioned in an earlier post, the telescope I work at/on/with is about a kilometer from the station, connected to the Dark Sector Laboratory. Every day, I hike out to DSL and back, usually twice. That puts me outside for an hour or so each day - not a lot, but enough to get a good feel for the weather and environment. To repeat the obvious, it's cold down here now. Spending fifteen minutes outside takes a little bit of preparation, mostly donning half a dozen pieces of Extreme Cold Weather (ECW) gear. I still haven't worked my way up to the heavily insulated Carhartt work overalls, but am otherwise pretty well decked out. 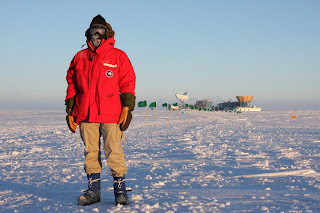 Blue boots, Big Red, and gauntlet mittens are the major pieces, complemented by some long undies, a second pair of gloves, a balaclava/hat/gaiter combo, and a pair of goggles. Together, all that keeps me pretty warm outside, to the point that I sometimes overheat when the wind dies down. Because some of the science projects are light sensitive, outdoor lights aren't allowed here. Once it gets dark, all the windows get blacked out, and buildings become pretty much invisible from any distance. Add to that the occasionally thick ice fog and enough wind-driven snow to cause a whiteout even in direct sunlight, and finding your way to work a kilometer across the frozen plain can get a little tricky. There's a flagline to show the way, and a well trod path has grown alongside it. I am trying to imagine. Such a cool blog. Sorry for the pun.